Serenity Now Travel Blog: Day 7- Snorkeling and Stank. Hananuma Bay is a protected beach/coral reef that has a paid admission. You must watch an instructional video before heading down so that you don't destroy the coral reefs that are everywhere, which people still do anyway. They had this song in the video that was not meant to be funny but Matt and I found it hilarious. It's supposed to be the fish singing and it has lyrics like, "don't step on me....don't feed me, I have plenty...". It was so funny. We were dying. Once the video was over we headed for the shuttle, which didn't charge us for Matt. The shuttle is $2 per person for all day use, which I recommend. That hill is steep and your bags will be heavy, at least ours were. I was carrying three bags today, so I was very grateful for that shuttle. Matt said for me to give him the backpack, but I didn't think that was a good idea. Once we arrived at the bottom of the hill, we found a spot to put our stuff. This place is gorgeous and has coral everywhere, even all the way up to the water's edge. It's a little difficult to navigate in areas since the coral is expansive and you're not allowed to step on it, so navigating can be a challenge. Matt went right in, but it was only 7:30am and if I got in the water now, I would have froze for sure. So I sun bathed while calling my mom and then reading my book, Long Shot by Mike Piazza. Matt was out there for 90 minutes and then headed back to shore to get me. It was perfect timing because I was hot and ready to get in. This was the first time I was using my new snorkel gear, so it took me a bit of time to get everything just right. We headed out, but I told Matt I only wanted to stay in the bay. I will tell you, if you stay in the bay, in my opinion it is not worth the trip. That area is where all the kids are and they step all over the coral there, so it's grey and the water is real cloudy. You will see some fish though, but the snorkeling conditions were not that great. Now, if you leave the protected bay area, in Matt's words, "you'll see the best snorkeling he's ever seen.". Matt saw all kinds of beautiful coral, fish, turtles, etc. He said it was amazing. My problem was that while he was in there the life guards made an announcement twice about the currents out there and that if you're not a strong swimmer or comfortable with your equipment, don't go out there. Awesome. That got me nervous, and once I'm nervous I'm not near as good at snorkeling. I hyperventilate trying to adjust myself to being used to breathing thru the snorkel. It's jot not good. So that's why I choose to stay in the lesser, protected area. I snorkeled for probably 45 minutes. It was fun, but very challenging at times as there are some areas that get real shallow over coral so you have to be careful how you swim to not hit it and cut yourself. I'm glad I did it and it's a nice, go at your own pace, type of snorkeling, which is right up this scaredy cat's alley. If I can do it, anyone can do it. We both had our own underwater cameras. Mine is more for pictures and Matt's is for video. I cannot upload from mine until we get home, so you won't see very many underwater shots from this one until we get home and can upload the pictures and videos. I'm not about to spend my vacation editing videos. I decided I had had enough so I left Matt for the shore, while he went back out to the better area. I laid in the sun reading my book, enjoying life. This day was finally turning out like a vacation day I had planned. Everything was going right after 6 days in Hawaii and I was finally relaxing and taking it all in. I laid there for another 2 hours while Matt snorkeled and sunbathed. His knee has not been giving him any pain and we know it's because he's been resting it so much between he crutches and the wheelchair. So I was glad for him that he could do this and not be in any pain. We were ready to head out at about 1pm. Our next stop was lunch at Honolulu Burger Company. Originally, I was going to bring sandwiches and enjoy them at the Bay, because I assumed we'd be there most of the day. With Matt's knee, that really wasn't an option because he definitely would have over done it. We were also going to go over and check out Sandy Beach, the beach where From Here To Eternity was filmed and see the blow hole, but we didn't care to much to do so. We've never seen the movie and we have another blow hole to visit when we're on the cruise. I'm sorry, but I can't take myself seriously writing that sentence, especially knowing my brother's going to be reading this and he always brings out my 13 year old (boy!) sense of humor. *snicker* Blowhole *snicker*. Anyway! Lunch was great. How can you not love a burger?! The restaurant was only about 1.5 miles away from our hotel, so the drive was pretty quick. We decided we'd park the car at the hotel and then walk to one block over to Waikiki beach. We had no dinner reservations to rush to tonight, so we figured this would be the perfect opportunity to swim the famous Waikiki Beach. Well, I was not about to get myself all sandy and wet again, so I held up a tree while Matt swam. We didn't stay long since this is not Matt's kind of beach. He likes waves. So we headed back to the hotel. Once back at the hotel, The Outrigger Regency on BeachWalk, Matt iced his knee while I caught up on typing my blog. It takes me just over an hour for each of the blog posts so I knew I had to get yesterday's at least written so that tomorrow morning I wouldn't have two to write. So since I was talking so long, Matt decided to get in the shower while I finished up the blog. I finally finished up the blog and it was about 5pm, so I headed for the shower. I got in the shower and thankfully, just before I started to wash my hair the water just stops. I turn the faucet on and off and I get nothing but the sound of air. Awesome. So I start yelling to Matt that I have no water and he answers with some useless comment like, "Hmmm.". So I get myself out of the shower and check the sink, nothing. Oh. My. God. So I get back dressed in my sandy, saltwater-covered clothing and head for the kitchen to check the sink in there. Nothing. So I ask Mr. Helpful to call the front desk. We had just had the maintenance guy up here about an hour earlier because we had a smoke alarm chirping due to low battery. So we wait the 15 minutes it took the guy the last time we called him. I explain the situation but he didn't get that it was all the faucets, not just the shower. So when I show him the sinks as well, his reaction was priceless. I knew this was going to be a problem. So he headed out to investigate and said he's be right back. An HOUR AND FIFTEEN MINUTES LATER I decide to just get dressed without showering after a full, hot and sweaty beach day and we'll just go have a now late dinner. Awesome. Juts when I start to relax. So as I reapply my make-up and try and make my hair look halfway decent, Matt heads down to talk to the front desk to get an idea of what going on. As I'm about to head out the door to meet Matt in the lobby, our phone rings. It's Matt telling me that the front desk offered to let me use a different room's shower. Thanks. That would have been helpful and hour and a half ago. It's now almost 7pm, and our jet-lagged butts have been going to bed at 8:30pm most nights. So that would mean we wouldn't get dinner until at least 8pm. Not to mention, I just reapplied my make up. Ugh. So off we went to dinner. This was my first go at pushing Matt in the wheelchair in Waikiki. It wasn't as bad as I thought, but maybe it was a good thing that I never got to shower, since by the time we reached our restaurant I was covered in sweat. It was still pretty hot out and I was working for my dinner. Going up and down all those curbs were not as tough as I feared, in that I never had trouble getting over them and forcing Matt to have to get out of the wheelchair, but it was tiring. People also are super annoying and don't give you any help. They cut you off, they don't move to the side and walk with there whole party lined up, line dancing style, talking up the entire sidewalk. It's just rude. You can tell the people who have never had to push a wheelchair before. They don't think how hard is it so be pushing it up a ramp and have to stop short and then restart again because they can't simply move one step to the side. Ok, I'm done. We make it to our dinner spot for the night. Now, let me explain. I had researched restaurants like a maniac before coming. The second most, highly rated restaurant in Waikiki is where we were headed for dinner. It is not the type of food I would choose and actually this was Matt and I's first try at it. I just figured it was so highly rated, it mush be good. It's so popular that there is a long line outside the restaurant just to place your oder. We both were not super hungry so we figured this would be the perfect night to try it since the line wouldn't be near as painful. Upon getting to the restaurant it dawned on me on why it's so highly rated- half of Japan vacations here! It's not being rated by Americans or any other nationality, for that matter, but 95% Japanese, just like the restaurant goers represented. Here I thought we were trying something new that we were late to the party on, but we found out quickly that most of America has not made it to the party yet either. We were at Marukame Udon, an Udon noodle place. So we get on the line, and I almost leave it about three times, but I force myself to stay and try it. We can always stop somewhere else for something with a little more substance and flavor if it's bad. Now I know why most of Japan doesn't seem to have a weight issue. It wasn't terrible, but it definitely wasn't good. 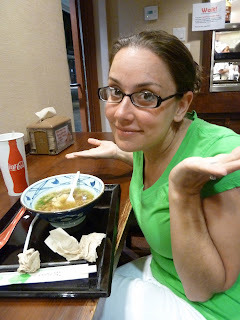 We both got the "beef" noodle bowl, but the broth tasted like fish- big time. Guess what Matt hates- big time. Fish. He took it like a champ and I will say the longer you eat it the less fishy it tastes. We're still not sure if that taste was in fact fish or really what we were eating, but it was an experience. The food actually filled us up and Matt ate all of his. I apologized to Matt quite often throughout our meal, but he was great about it. Probably because he feared another epic meltdown from your's truly after the whole no water thing, that we still didn't know what was going on with. Last we left it with the front desk was, they had no idea what was wrong, all the rooms that number's ended in 5 had no water, they thought it was from the construction from next door, but the workers had left for the evening. Awesome. They would "leave us a note" when they found the issue. I guess there's not someone at the front desk throughout the night. I don't know. After our taste of Japan, we walked around Waikiki and checked out the Duke statue. Then I did a tiny bit of shopping. We wanted to head to Yard House so that I could finally try a new dessert of theirs that I've been dying to try, but the wait was 50 minutes, so we decided to get some snacks and drinks at the nearest ABC store and enjoy them on our balcony. Once back at our resort, not knowing if we would have to change rooms- God help them if we did, we found out that the water problem is fixed. So I finally head for the shower to get the Pacific Ocean and all of it's habitants off of me. It was the best shower ever. We never got any explanation of what happened, as they still don't know themselves, so we'll see if it happens again. Murphy's Law Vacation...that's what I'm dubbing this one. We're at least at the point that when the next negative hits us, we just laugh. I mean, you can't make this stuff up. The day I finally feel relaxed and on vacation, up no water. I mean really. 2 things: "Murphy Law Vacation"
Promise, you'll laugh someday, promise!